If graduate school is a marathon, it seems it will be a sprint to the end. At least, that’s what I found myself thinking up until last week. Since starting the Higher Education master’s program at Boston College in September 2011, I’ve found much of graduate school to be about pacing. Balancing coursework, assistantships, and life has involved setting appropriate time goals and pacing myself to meet them. Although grad school is arguably an individual sport on paper, my peers and I came to train as a team, supporting each other through courses, conferences, and the highs and lows that come with this terrain. It was fitting, then, that I spent Marathon Monday with them, first cheering on runners near mile 23 and later communing around a TV in one friend’s living room, watching in shock as the events unfolded and messages were exchanged to account for those we knew in the marathon or near the finish line. 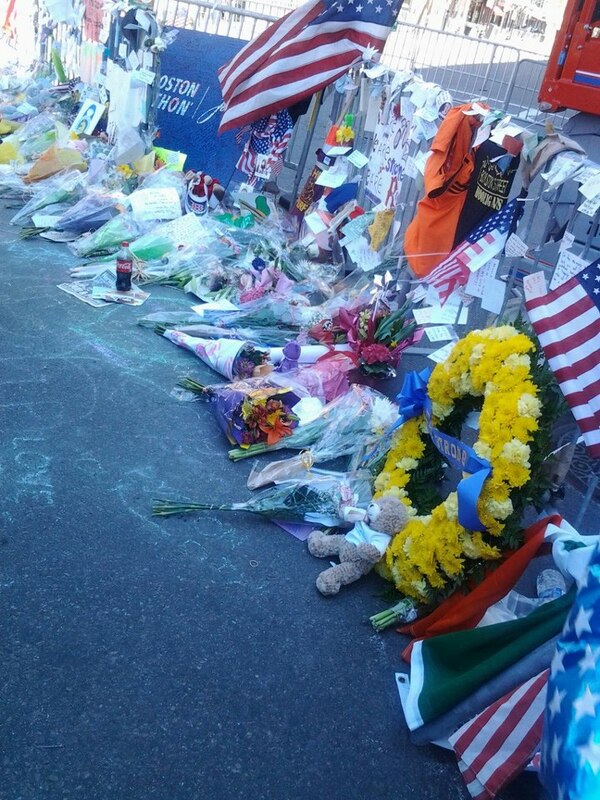 In the days after Marathon Monday, memorials bloomed at each of the barricades surrounding the Copley Square area. Successful marathon runners will also tell you to know the course. You should aim to expend energy at a relatively even rate throughout the marathon, which means slowing down when running uphill and speeding up when running downhill. Although our bodies will tend to react this way naturally, studying the course beforehand—knowing where the hills are—can help you develop your pacing strategy. As we were entering the final weeks of the semester, I was feeling like my pacing was off—that I would need to sprint up the hills, even if that meant losing balance and expending too much energy. On Marathon Monday, though, I stopped sprinting and joined my peers in taking stock of where we’ve come from and the roles that we can play in the lives of each other and our students. What is different about today—about the marathon we are embarking upon—is that we do not, cannot, and I suggest should not know the course. As a student affairs professional, I understand that there is no one-size-fits-all approach for supporting students through their meaning-making process. Through our coursework, professional experiences, and support of one another, though, we can equip ourselves with the tools and training needed to be partners in this process, to challenge and support students in the myriad ways that they will integrate the events of the past weeks into their lives. Indeed, as we wrestle with the concepts of life and death, the constructs of ‘good’ and ‘evil,’ I challenge us to sit with the gray areas in between. As we ask the question “why?” of Tamerlan and Dzhokhar Tsarnaev, I find pause to ask “why?” of myself, questioning my assumptions and sitting with the unknowns that times such as this bring to the surface. It means understanding, and accepting, that we do not know this course, while simultaneously embracing our collective journey on it. This is where learning happens, and it is not a sprint. 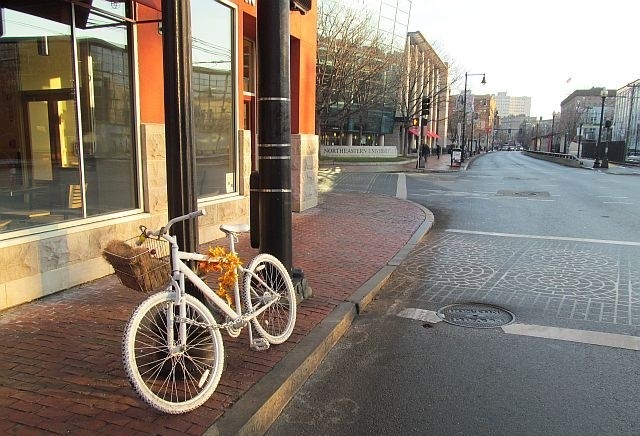 A ghost bike was installed in Kelsey Rennebohm’s memory on Huntington Avenue and Forsyth Street. Last June 2, I was literally sprinting down an escalator to catch a train when I received the call that one of my dearest friends had died in a biking accident on Huntington Avenue. Kelsey was a beautiful, wise, kindred spirit, and quickly became my closest friend after we met in the halls of Campion on the first day of classes in September 2011. We laughed that we were meant to meet, after discovering that she was the sister of a former roommate of mine in California, and that we had both recently moved to apartments only a couple blocks from each other in Brookline. I think often of moments like these, when we are in the presence of something truly special unfolding in our lives. Then, and now, I feel deep gratitude for the opportunity to share this life with one another; to support each other today and everyday in growing as individuals and communities. When I learned of the Marathon bombings, my heart sank to depths it hadn’t felt so tangibly since June 2, when I found myself in physical and emotional distress on the Back Bay Station commuter rail platform. Trains, and people, came and went; I paused like I never had before. In the days, weeks, and months following, I learned—I had to learn—that this process was not meant to be a sprint. I learned to reach out to others, often stubbornly releasing my ‘helper’ role and opening myself up to new conversations and connections. I learned that we can simultaneously help and be helped, and that this is the meaning of community, of what we hope to engender in the communities of students we support. I learned to appreciate quiet solitude, to allow myself to push pause when I need it—sometimes, even especially, when school and work are feeling like a sprint. 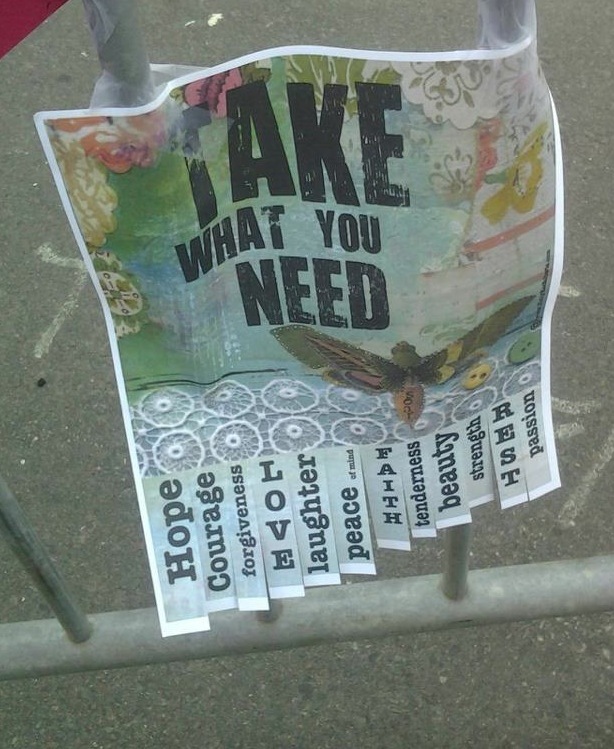 An important reminder to all of us, posted on one of the barricades near Copley Square. When I speak with students about the past week’s events, I notice—as Lynch School Professor Joseph O’Keefe, S.J. so eloquently put in his homily on April 21—that we struggle to “understand what seems incomprehensible.” I think of all of those at the marathon finish line, joining with the rest of the city to celebrate the marathon runners—their efforts, their stories, their causes. There was no sense of danger; on the contrary, as a spectator myself, I felt an overwhelming sense of care and strength as I cheered on runners with thousands of others near mile 23. For many, there were friends, family, or co-workers among the runners; but for all of us, there were strangers who let us into their worlds, sharing their names in block sharpie print for us to call out and, in that moment, become more than strangers. I feel a strong sense that this is one of those ‘beginnings.’ It is not meant to be easy; it won’t be easy. It is a marathon, but one that—in true Boston spirit—we will be stronger for completing together. Caitlin Green was a Master’s candidate in the Boston College Higher Education program and a Graduate Assistant at Boston College at the time of the Boston Marathon tragedy. The author’s views are their own and do not represent those of any institution, entity or individual. You can reach out to Caitlin directly via tweet or email. Please feel free to share this on your social network of choice using the link icons below. We also welcome you to share your reactions and stories in the comments section below so we may all benefit from your thoughts and wisdom.